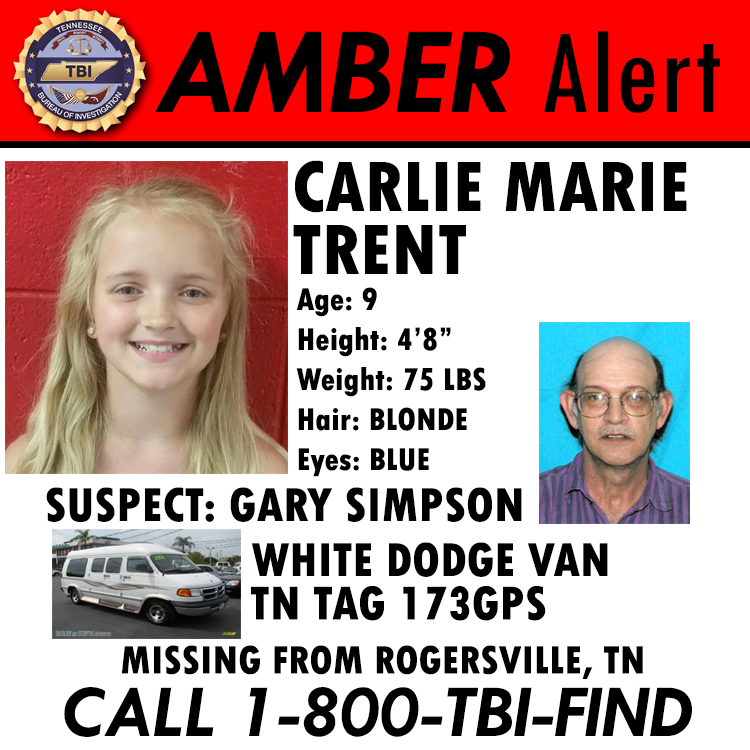 A Middle and East Tennessee AMBER Alert, issued by the Tennessee Bureau of Investigation on behalf of the Rogersville Police Department, remains in effect for 9-year-old Carlie Marie Trent. On Wednesday afternoon, May 4th, her uncle by marriage, Gary Simpson, removed Carlie from school under false pretenses. He currently has no custodial rights to Carlie. During the course of the investigation, authorities have developed specific and credible information which leads law enforcement to believe the child is in imminent danger of serious bodily harm or death. Since issuing the original Endangered Child Alert Wednesday, and upgrading the alert to an AMBER Alert on Thursday, TBI Agents and Intelligence Analysts have worked to coordinate and verify more than 1,700 tips, originating from at least 19 states: Tennessee, Kentucky, South Carolina, Virginia, West Virginia, North Carolina, Georgia, Louisiana, Florida, Missouri, Idaho, Arkansas, California, Alabama, Washington, Pennsylvania, Mississippi, Montana, and New York. At this time, however, there have been no credible sightings of Carlie Trent, Gary Simpson, or the van in which investigators believe the two may be traveling. Though their whereabouts are currently unknown, investigative efforts suggest they may be out of public view and in an isolated area, such as a campground or park. 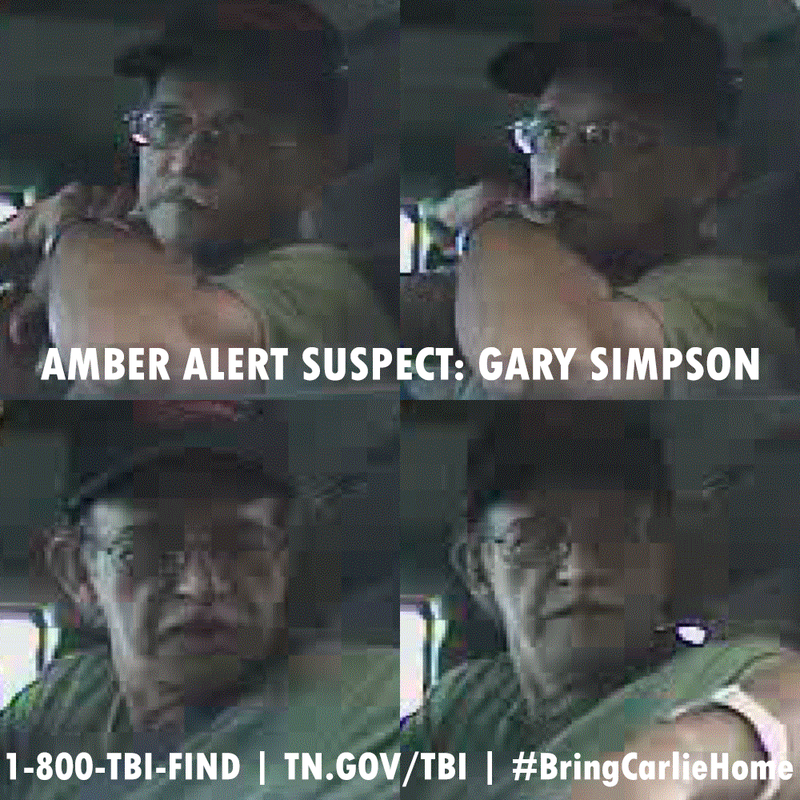 Today, the Tennessee Bureau of Investigation added Gary Simpson to its Top 10 Most Wanted list. The warrant for his arrest was amended today to a charge of Especially Aggravated Kidnapping in connection to the child’s disappearance. Surveillance video from a Rogersville bank (LEFT) depicts Simpson withdrawing funds on the morning of May 4th, shortly before visiting a Walmart store, picking up Carlie from school, and taking her to a local grocery store, where he purchased approximately $80 of non-perishable foods and paper products consistent with camping or travel. The TBI continues to operate the search from its Headquarters in Nashville and a Command Post in Rogersville in an effort to investigate tips, leads, and coordinate the flow of information with local, state, and federal partners. On Sunday, the United States Marshal’s Service dispatched a similar command post to Hawkins County in an effort to do the same. Ground searches, involving several partner agencies continue, along with air searches by helicopter, performed by the Tennessee Highway Patrol, which began late Sunday and will be ongoing on an as-needed basis as part of the overall search effort. The reward for information in connection to this case now exceeds $40,000. The United States Marshals Service has offered a reward of $5,000 for information leading to the arrest of Gary Simpson and the safe recovery of Carlie Trent. Additionally, Dr. Chris Calendine, Carlie’s pediatrician, has indicated to TBI he will offer $10,000 in reward money for information leading to Carlie’s safe recovery. Anyone interested in contributing to the reward effort can email BringCarlieHome@gmail.com or call (423) 923-9100. There is also an online platform for the effort at BringCarlieHome.causevox.com. Carlie is 4’8″ tall, weighs 75 lbs with blonde hair and blue eyes. She was last seen wearing a black and grey tank top and blue jeans. Simpson is a 57-year-old white male, 5’10” tall, weighing 157 lbs. He is balding and has brown hair and eyes. He was last seen wearing a brown cap, a dark colored shirt and jeans. He was last seen driving a white 2002 Dodge Conversion Van with TN registration 173-GPS. The van has a dark stripe down the middle with light gold running boards and paint is chipping off of the hood. Warrants have been issued for Simpson for Kidnapping. The Tennessee Bureau of Investigation will continue any and all efforts to locate these individuals as quickly as possible, and as part of that effort, continue to reach out to local, state, and federal law enforcement authorities across the region to disseminate the information and pictures as widely as possible. Surveillance video of Gary Simpson and Carlie Trent, along with video of Carlie released by the TBI in recent days, is available for view on the TBI’s YouTube channel. Additionally, the TBI is issuing updates on this case via social media on Twitter (@TBInvestigation) and on Facebook. The TBI continues to urge the public to remain vigilant and alert law enforcement if they see the child, the suspect, or the van involved in this incident. If anyone has information that may prove helpful, they may contact the TBI at 1-800-TBI-FIND. If anyone spots the van and can safely verify the van’s license plate to include 173-GPS, call 911.